There are already a lot of great paste paper tutorials out there, but I’ve always wanted to write one. Teaching bookbinding at the University of Utah last semester was a good excuse to finally get my own tutorial put together. So without further ado, here you go. Click here for a PDF of the tutorial. 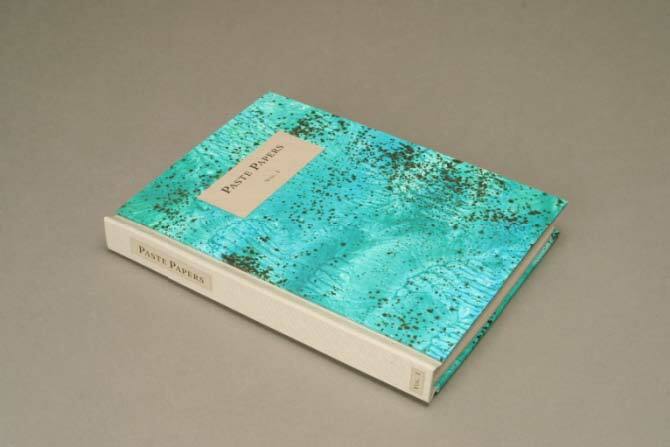 Paste paper is one of the oldest decorated papers used by bookbinders, and can be found in books that are centuries old. 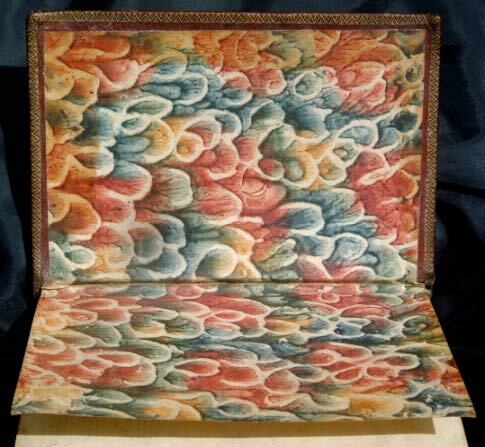 Going back hundreds of years (and continuing today), sometimes bookbinders would use up their leftover bookbinding paste by throwing some pigment into the paste and brushing it out on some paper to make decorative papers to then use in bookbinding. They would then make strokes or stipple patterns with a brush in the paste, or use a tools to draw or comb designs in the paper and let it dry. 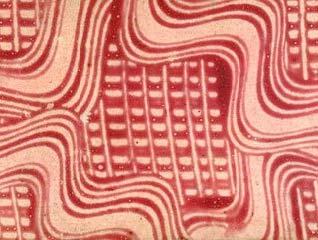 One of the distinctive qualities of paste paper is the rich 3-dimensional patterns and designs. This is achieved because when the paste is first applied to the paper and a pattern made in the paste, it is thick, with peaks and valleys. 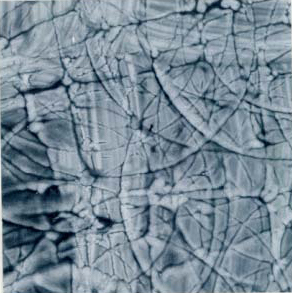 As the paper dries, the paste is sucked flat into the paper, leaving a 3-dimensional pattern on a 2-dimensional surface. 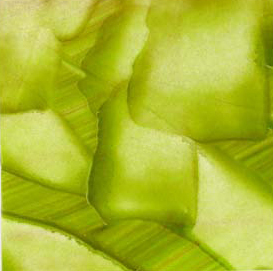 There are as many recipes for paste paper as there are variations in paste paper design, and many of them can be found by doing a simple Internet search. Any of the recipes you find should work great. Some pastes dry smooth and shiny while other pastes are formulated for a more matte effect. As a general rule of thumb, I would rank pastes from glossy to matte in the following order: corn starch, glycerine, methyl cellulose, rice starch paste, wheat starch paste, wall paper paste. Also keep in mind that cooked pastes will typically dry smoother/shinier than raw pastes. Mix one cup of cornstarch in 1 cup cold water. Boil 7 cups of water in a large pan. After the water is boiling remove the pan from the stove and add the cornstarch slurry without delay. While combining the slurry with the hot water, mix it with an electric beater to prevent lumps from forming in the paste. Beat the paste for a minute or so to make sure all the starch is mixed. The consistency will be like heavy syrup. Store the paste in a rust-free container, covered with a lid. Keep it in a cool place and the next day when it was become much stiffer, remove the skin on the paste and run it through a food processor. Add only enough water to allow the paste to swirl and form a vortex. 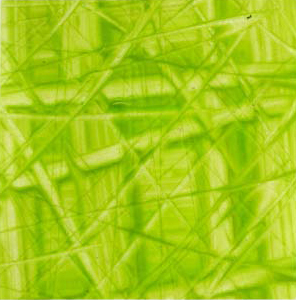 I typically use acrylic pigment from a tube, but other pigments such as tempera, tube watercolor or gouache, or even ink can be used. Place a cup or two of paste into separate containers (however much you want for a certain color) and add a teaspoon or so (or a squeeze) of pigment at a time until you have the color you desire. 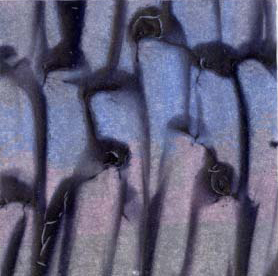 More pigment will make deeper, more opaque colors. 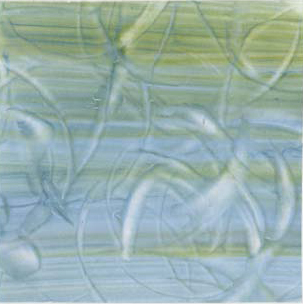 Keep in mind that the more opaque the pigment, the more opaque the paste paper pattern will be, and the more transparent the pigment, the more transparent the pattern. 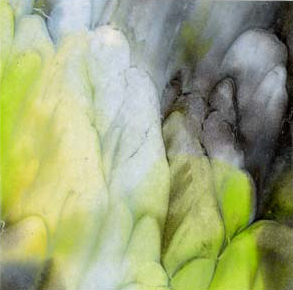 Metallic acrylics add an interesting contemporary look/sheen to the papers, and I have discovered that sprinkling wet papers with walnut ink crystals or metallic powder also makes for some wonderful papers. As I’m sure there are pigments I have not thought of or mentioned, be creative! Paste paper is essentially glorified finger painting, and this is where creativity comes in. An assortment of brushes of various shapes and sizes, especially stiff bristles, make wonderful textures, as do fingers. I would argue that if you only used two tools, Brushes and fingers are the way to go. Anything else you can find that will leave an interesting mark or texture when stamped or dragged across the paste will probably prove to be a great tool. I have used: Natural sponges; foam stamps and rollers with patterns; the wheels on toy cars (can make very interesting tracks in the paper); spatulas and egg beaters; forks and spoons; rubber combs (found at a craft store) or your own combs made by cutting chinks out of some binders board; scrapers; and one of my favorites is a repeated pattern of a rosette cookie batter dipper. Once again, try things out. You are only as limited as your imagination. (Pictured above: Assorted tools for making paste papers: brushes, fingers, spatulas, combs, scrapers, patterned fried-cookie dippers. Be creative and find your own tools). It is best to have a large clean working space. I like to cut out a large piece of Mylar to make the papers on, this way the counter or table stays clean. I also like to have a large roll of paper towels and a spray bottle on hand for clean-up of my workspace after each paper. I typically use Mohawk superfine, but any text-weight paper will do. Colored papers show through the paste and are also very pretty. I start by laying my paper out on my clean mylar surface. I like to dampen the paper with a spray bottle or a sponge to completely relax the paper, but the paste can also be applied directly to the paper, which causes it to be absorbed more deeply and leaves colored stains behind as you scrape the paste, which can be an interesting effect. Next, I apply color to the paper. Typically I just plop spoonfuls or glops from my brush fairly uniformly across the paper. 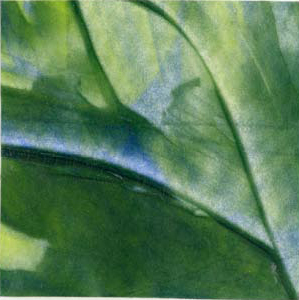 Just as adding several pigments to a watercolor increases the depth of a painting, I typically like to use 2-3 colors of paste (even if the colors are similar, such as all greens or blues) in my papers (unless I am going for one solid, uniform color). 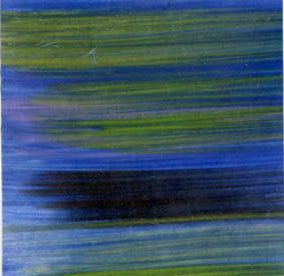 Next, I brush the colors across the whole paper, and the colors start to blend together. The more you brush, the more the colors will blend into one color. Just the bristle marks alone will be beautiful, and if you are happy with the paper, you could stop right here. Alternately, you can stipple pattern into the paste with the brush, or use your fingers, the combs, scrapers, etc to make interesting patterns or textures. As mentioned before, this could also be a good time to sprinkle the wet paper with ink crystals, which will darken and soak into the paste, making gorgeous dark speckles in the paper. Once you are satisfied with the design (and I find that the less I work the paste i.e. the faster I make the design the better the paper tends to turn out), set it aside somewhere to dry. Clean your mylar workspace and start over with another paper. Once I’ve made a paper I love, I like to make at least one or two more identical papers so that later when I go to use the papers for a bookbinding project, I have enough paste paper to complete the project. 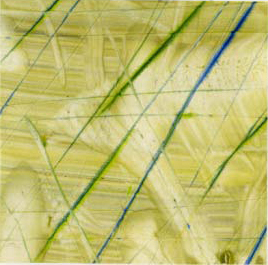 (Pictured above: Paste papers made using brush strokes and fingers). 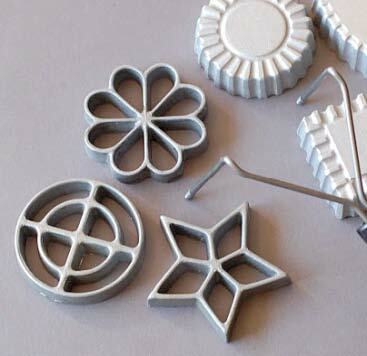 (Pictured above: Egg beater dragged across the paper; rosette cookie mould stamped repeatedly; the handle of a screwdriver rolled on the paper; and the rim of a drinking glass repeatedly stamped and lightly dragged). Pull-papers are made by brushing pigment onto a paper, and then folding the paper in half while the paste is wet. A pattern can be drawn onto the folded paper (the side with no paste) with fingers, a stylus or the back of a brush, and then the paper is unfolded. A beautiful pulled pattern is the result. 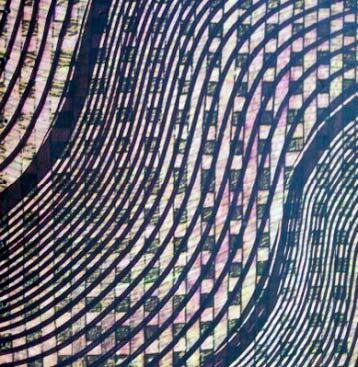 I like to make a striped pattern across the paper by putting globs of colored paste in a line all across one side of the paper. 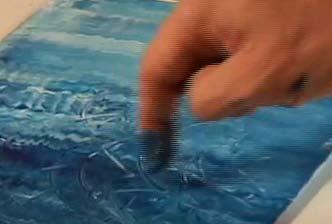 I then take a scraper and pull the pigment across the whole paper. 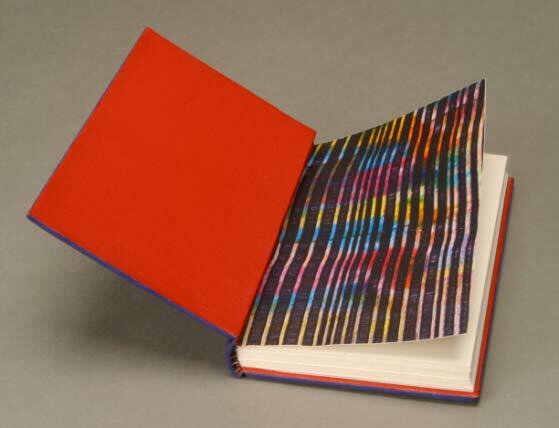 The result is colorful stripes across the paper with a lot of the white of the paper showing through. 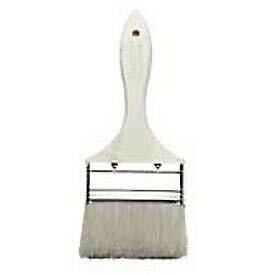 Once one color and design is down, go back and apply little accents of color from a brush or tool. Or, one color can be applied in an even coat, then dried. You can then return and do an additional pattern on top, This is especially striking if the second pattern is made with a comb, since it removes the color and reveals the color underneath. 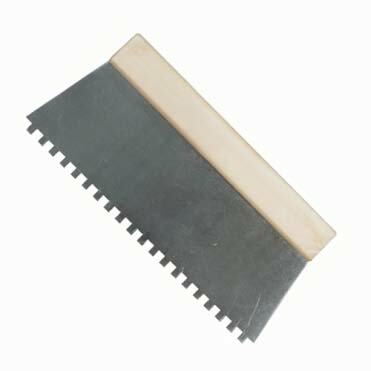 Combs are incredibly versatile and a favorite tool for many paste paper makers. Try different things with the combs: Dragging them across the paper in a straight line, wavy; then maybe try coming back and combing across the paper in a perpendicular or diagonal pattern across the first lines. Most of all, use your imagination and have fun! 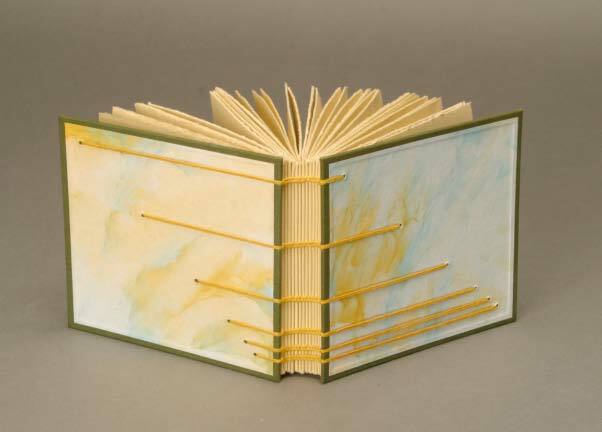 (Pictured above: Pull papers (1&2), layered colors, and combs used in multiple directions). It is useful to keep in mind that the more papers you make in a single sitting, the more space you will need to dry them. When we would make these in bookbinding class at BYU, we would line the entire hallway with a long roll of newsprint and lay the papers out to dry overnight. Papers can also be hung from a clothesline or laid out on a drying rack. Just make sure that if you are drying the papers indoors, there is something to catch any colored drips. The papers will curl up and cockle as they dry. Don’t worry—this is normal. When the papers are used to cover a book, they will relax again (I like to very lightly mist them before I glue them out to help them relax) and dry perfectly smooth. You can iron the papers so that they store more easily. 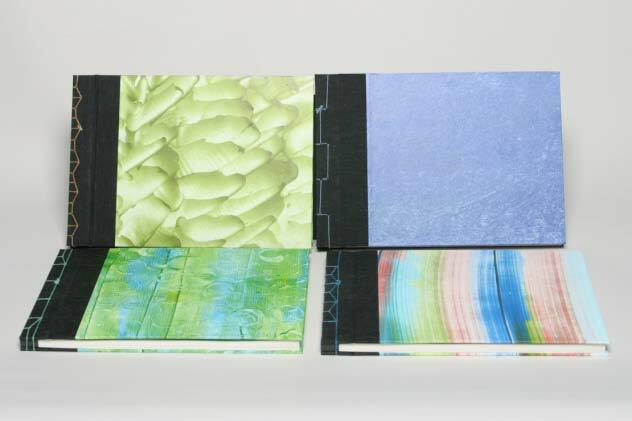 (Pictured above: Books bound using paste papers). Enough said. Unfortunately, making paste papers tends to be messy (the bigger the mess, the more the fun, right?) 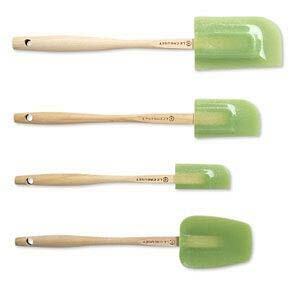 It is really ideal to clean up your brushes etc in warm soapy water immediately. As long as you take good care of your tools, you should be able to reuse them again and again. I’m definitely going to have to give that a try. I think they are beautiful. Thank you for this detailed pdf. It’s fantastic !! I will try for sure! Thank you for the information. I had been keeping the link to your wonderful paste papers in my favourites, so lucky to find your tutorial. i really enjoyed your tutorial. i’ve made paste paper before, using flour with the addition of white glue to bind it, but i am trying your recipe today, in preparation for an art workshop i will be doing with a group of school children tomorrow. they are street children being educated at a charity school, and they were fascinated by a simple technique like potato printing, which i did with them last week. it was supposed to be for the kindergarten age group, but the older ones slipped in and insisted on doing it too. thank you. your tutorial has given me great ideas for tomorrow. Beautiful work. I jus made my first paste papers and bound 2 books. They look beautiful but I am concerned that the paste paper won’t wear well. How do you finish? Is there some sor of sealant that can protect the paste paper design? I just did a Coptic stitch with paste signatures and the paste seemed to get scratched off as I worked. Any suggestions? Wha is the best type of foundational paper for paste decorating? Thanks so much you are ver talented! I’ve had the paste paper cracking problem, too. And honestly I’m not sure that there is any good way to protect it. If you use a strong absorbant paper and a not-too-thick paste that soaks nicely into the paper, you may have less of a cracking/chipping problem than if the paste is thick and sits on a harder paper… Sorry not to have better advice! I’ve been told that a few drops of glycerin added to the mix helps the cracking problem. I’m not sure, though, how much it actually helps. You do have to be careful not to add too much, or it can alter the quality of the paste. 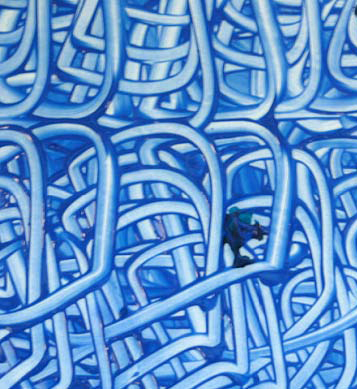 I wanted to say this is one of the absolute best paste painting tutorials I’ve found online, and I’ve done a lot of prowling online for paste painting info. Thanks so much for posting this. I’m so glad people are using this tutorial and enjoying it! Thank you! Thank you so much for putting this together. I’ve shared it with my Creative Book Artists group and we’ve had a lot of fun trying it out. And made some awesome books with the product. Oh, how fun! Thank you for letting me know you enjoyed it! I have just come across your tutorial…..have never heard of paste paper before, although I have made hundreds of handmade paper sheets, at home and while at art school. I cannot wait to give this a trial as soon as I can. I have dyed my papers, done some resist dying as well on the papers, stitched them, folded them, etc…. Thank you so much for your clear step by step instructions. 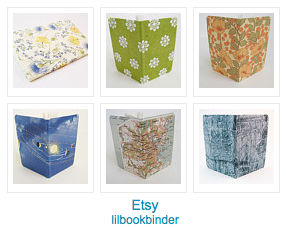 this previous comment of mine is about Lili’s Bookbinding blog–Topsy.com, and how much i enjoyed reading it. This is a great tutorial – thorough, crystal clear, well illustrated and with a PDF to boot! Thanks for sharing it with us all. Hi, I’ve done a fair bit of paste paper decorating, but very haphazardly. I want to do some workshops at a festival this summer so need to be a bit more together about it. Found your article really clear and full of useful information and ideas. Thanks for this, really inspired and looking forward to doing lots more experimenting now..
Nina, thanks for leaving a comment–I’m happy to know that people are using the tutorial! I really appreciate your beautiful designs and the opportunity to read about your process for making paste paper. What type of paper are you using? I use a 100 lb smooth bristol, however, it is difficult to cover (bend over) book board. 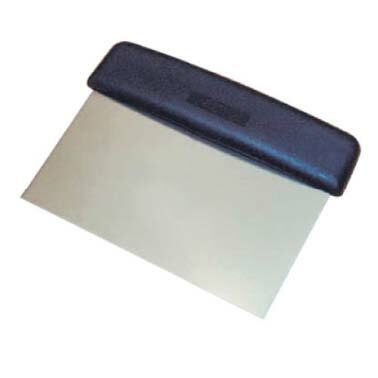 Do you us a more flexible paper? Dear Lili, It’s been years since I took a paste paper course in Western MA and have lately been craving to do more but could not remember how. Thank you so much for this incredible step by step tutorial. With all the paste papers I made before, I cut them to card size and no matter what calligraphy ink I used, it wrote beautifully, even white gouache on the darker surfaces. Inside I would lightly tack quality white paper for a nice writing card. These make great gifts. Paste paper also makes beautiful bookmarks. I have a variety of papers and am anxious to experiment on them. Thank you so much again for helping in my search. 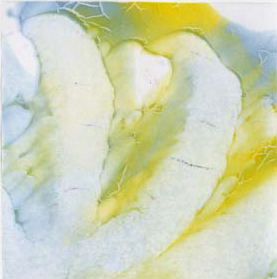 Do you have a recipe for me to use corn starch to resize my watercolor paper? I have overworked areas and the paper is too absorbent now for me to finish. 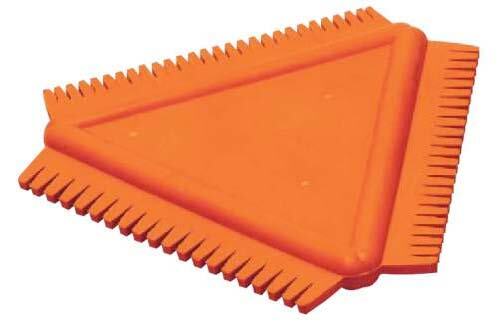 It would be a surface application. Or should I purchase something and where? This looks really great and I shall give it a try. My only concern is, are there any problems with the steadfastness of the medium? Will a book with this medium rub off onto another book in a shelf? Can the paste break down? Also, are acrylic paints the way to go? Thank you so much. 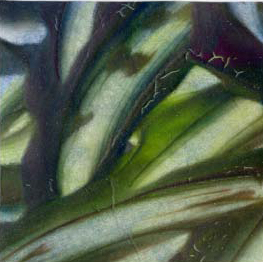 I loved making paste paper years ago, and now you’ve helped me recall the process. I’m eager to try it again! Lily,thank you for sharing your ideas to make beautiful paste papers. I make paste papers too, and your tutorial has given me more ideas to experiment. Hi Lili – I just came across your fantastic post and tutorial. Thanks for sharing your technique and gorgeous examples. It’s been a few years since I’ve played with paint and paste and you’ve inspired me to gather my materials and swirl some colors around! thanks vaguely remembered doing this as a child in art classes but could ‘nt remember how! Your post is very clear with lots of lovely examples to inspire, so much so that i will be doing this with my kids soon! So thank you again! what a great idea, sharon! i’d love to give this a try! I have a question about how much it actually makes. I haven’t done paste papers in years and it was in a classroom setting, if I have 26 kids and they are all doing about 8 sheets of 9×12 paper how much would you suggest I mix up? I hope our post will draw in some more visitors to your site. Keep up the good work and again, many thanks for taking the time to write this! 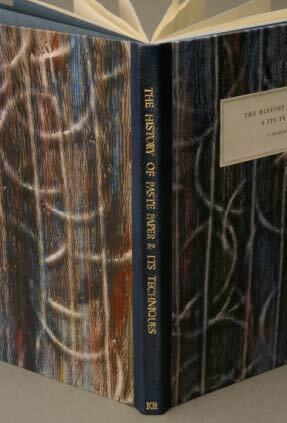 1) I saw a binding of a book titled The History of Paste Paper and Its Techniques. Is this a book you wrote? Could I get a copy of it? 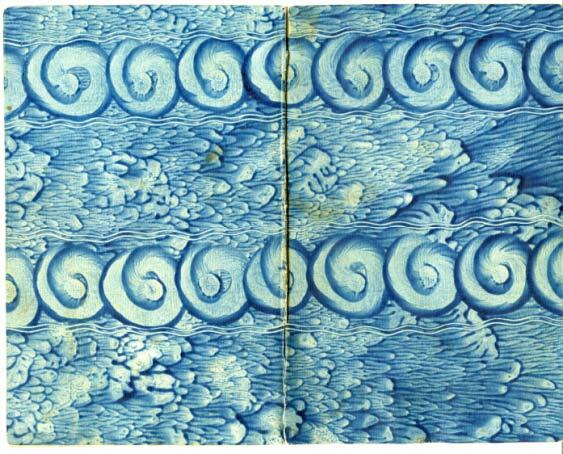 2) I am writing an article about decorated endpapers and I saw a beautiful example of a paste paper endleaf on your site. May I use that image in my article? It will be in a book published by Oxfore University Press next year. Hi – I love the design for the second book featured from the top (yellow with a super interesting stiching pattern for the cover). Do you have a tutorial or could you direct me to some resources? I’d be over the moon to be able to make something like that. Please don’t feel abandoned. – Are you happy now?